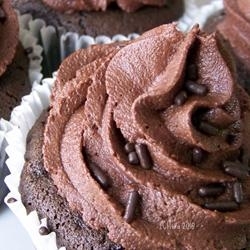 What I like about this easy chocolate frosting recipe is the high ratio of butter to sugar compared to similar recipes. Just as expected, it produces a very rich and creamy frosting that does not dry out or harden. I don't find the frosting too sweet, and turns out nice and fluffy - both great things when you are piling it on cupcakes. My advice is to make this a night ahead and chill it so the cocoa flavor can really mellow and the flavors can come together. Be sure to remove it from the fridge at least a half hour before using because it is pretty hard otherwise. This is enough to easily frost two 9 inch cakes. In a large mixing bowl, cream butter until light and fluffy; at least two minutes. Gradually beat in confectioners' sugar, cocoa and vanilla. Now for the half-and-half. The best way to do this is to add 1/2 cup of it first and then 1 tablespoon at a time as you are mixing it. Stop the mixer and take a rubber spatula and spread it around the frosting as though you were spreading it on a cake. When you pull away the spatula, if it 'sticks' to the frosting and forms very stiff peaks when you pull it away - it is too stiff and you need to add more liquid (again, only add a little bit at the time). You want the consistency to be very smooth and creamy; then it will spread with no problems.